Organising group transport can be a tedious task when you’re trying to budget out costs. However, the cost of motorcoach transport doesn’t have to be complicated. No rate is ever the same for one trip, but there are several factors that can affect the overall cost, such as the time of the year and your group’s size. Quotes may vary from these rates depending on your group’s specific needs and your trip’s details. We’ve put together a guide to help you get started planning your trip’s budget. 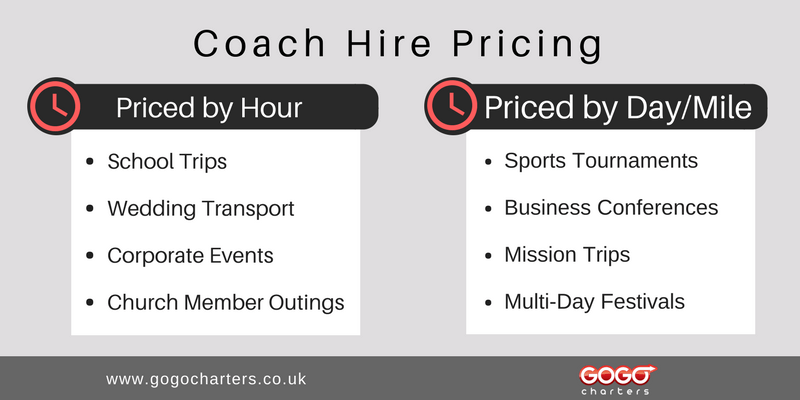 You’ll see examples of coach hire quotes, different factors that may affect price, and advice on getting the most value out of your coach hire. On August 15, The Bailey Group, a company headquartered in Birmingham, is going to a company retreat in London with 54 employees, which is a 2 hour and 20 minute drive. They will be at the event for 3 hours before heading back home. Team bonding is a nice break away from the office, especially when alcohol is involved and a coach hire handles all the transport. The Bailey Group is in need of a full-sized 56-passenger coach hire for their trip. The Event Coordinator received a quote of £688 for the coach hire, and plans to tip their driver 15% for their attention and service. The Leeds Knight rugby team is travelling from Leeds to Sheffield for a rugby tournament, the last game that ends it all. The team consists of 15 players and 2 coaches. The team is planning to leave on March 20 and returning to Leeds on March 22. The assistant coach, Jesse, calls to get a quote. The Leeds Knights wouldn’t even be here if Jesse hadn’t gotten ahead of the game and booked their transport in advance. Jesse receives a quote for £1,269 for an 18-passenger minibus hire for the duration of three days. Since the team will be staying in Sheffield for two nights, they are required to provide hotel accommodations for the driver. They book a hotel at a discounted rate of £49 a night for their driver’s room, and decide to tip the driver 10%. Maid-of-honour Sarah is planning the perfect hen do for her bride-to-be Lacey in Newcastle on July 24. She is in need of a bus for the party that can carry 13 passengers for their big bridal party. Lacey and her 12 bridesmaids will leave for dinner and pub-hopping at 6pm and return home at midnight. 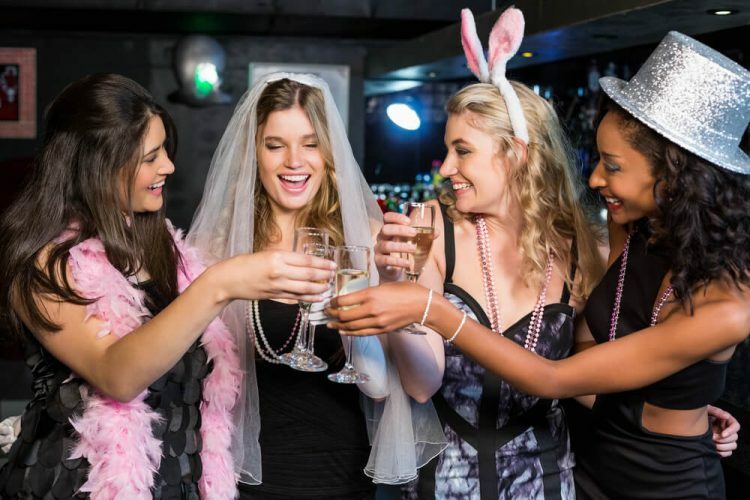 Thanks to Sarah, the best maid of honour ever, the whole party can enjoy drinks at the hen do knowing their minibus will bring them home safely. For a 6-hour minibus hire in Newcastle, Sarah received a quote for £588 and decides to tip her driver 15%. Are you wondering how we got these prices? 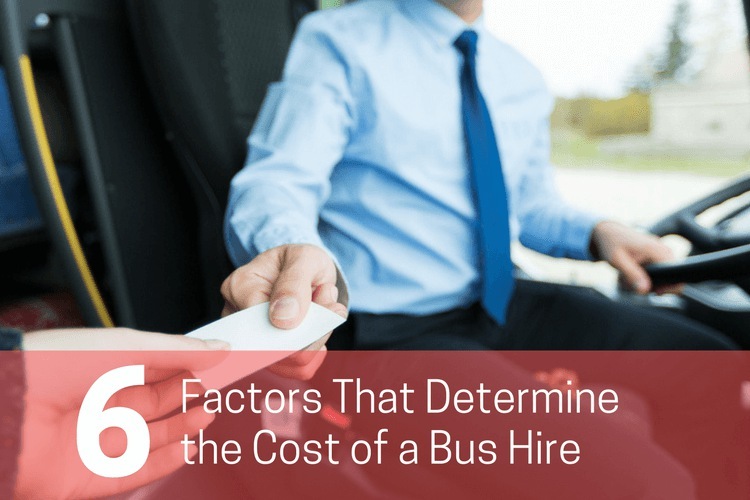 Keep reading to learn more about what factors can influence coach hire prices and how to get the best value for group. When you book your trip, your reservation specialist will first look at how long and far you’re travelling to prepare your quote. Before speaking to a representative, be sure to have your pickup location, drop off location, and times ready. Coaches are hired by hour, day, or mileage. For example, if you’re travelling in and around the city where the bus is stationed, you will be charged by hour. Please keep in mind that most coach hire companies require a 5 hour minimum. If you’re planning a trip that spans a couple of days, like for a conference or festival, you will be charged a daily rate. If you’re planning a one-way or return trip to and from a specific city, most coach hire companies charge by the mile. We know that trip itineraries can change last minute. While it’s ideal to avoid changing details of your trip, your driver may be willing to take unplanned detours. Even if you’ve already paid for your trip in full, you may be charged for additional mileage outside of your original itinerary. Coach hire rates change with the seasons. For example, coach hires are booked more often when school is in session, causing high demand and low supply. During dead seasons, more buses go unused because demand is low, causing coach hire companies to compete and lower their prices. 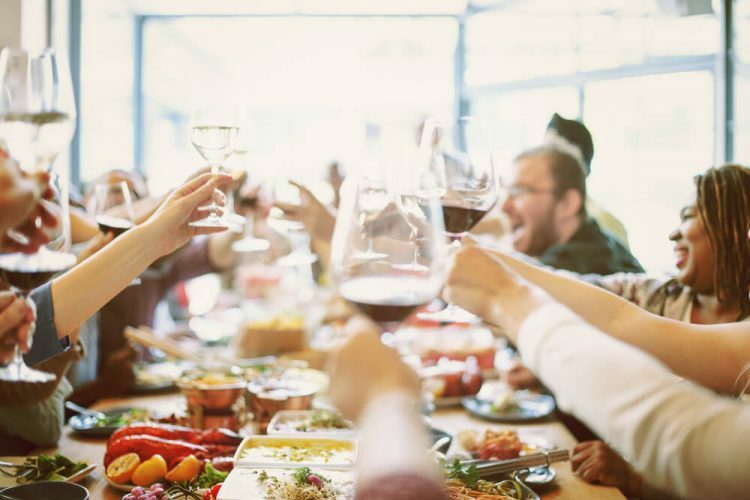 The most expensive months for coach hires are May, June, and July due to graduation, end-of-the-year school trips, prom and formals, family reunions, vacations, and more. Also, keep in mind that rates tend to be higher during the holidays. January, February, and August are the least expensive months to book a coach hire because of winter weather and the end of summer. No matter when your trip will take place, though, it’s best to book your trip 3-6 months in advance to get the best deal. Big cities like London often don’t have as many coach hire companies as surrounding metropolitan areas because of public transport and smaller streets that are not ideal for commercial vehicles. This causes a higher demand and lower supply than average, and groups travelling from cities where there are fewer coach hire companies will often pay more. 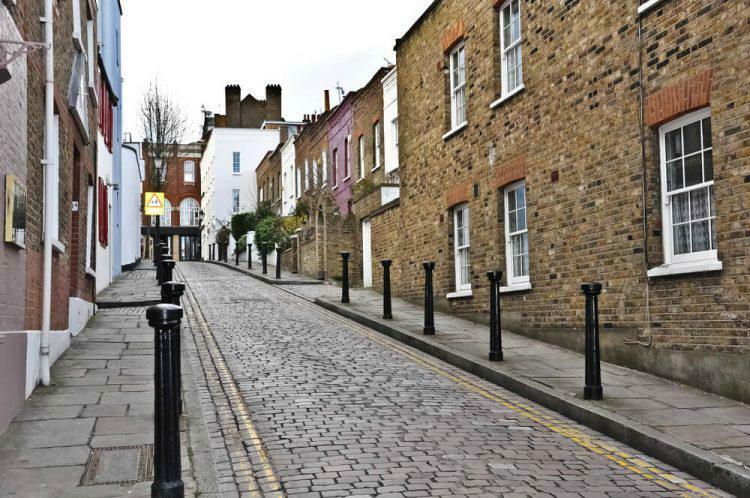 With hectic traffic and tight roads, some parts of London aren’t accessible for commercial vehicles, like London Street. Additionally, if your group is getting picked up in a different city than where the coach hire service is originally headquartered, your cost will increase. You will be charged for any additional mileage that your coach hire has to travel from their headquarters to your pickup location. The cost that accumulates while no passengers are on board is known as deadhead. Some routes will face toll roads, parking permits, and other additional transport fees. Some coach hire companies might not include these fees in their quotes, so ask ahead of time if you will need to pay for any toll bridges or parking fees. You may also need to contact the hotels or venues you plan to visit to get specifications on coach parking. Be sure to call your hotel and venue to confirm any designated parking spots available for buses. EU Regulations require that drivers only operate their vehicles for 9 hours in a day and take a break every 4.5 hours. If your trip requires more than 9 consecutive hours of driving, your coach hire service will need to provide an additional driver. While a second driver will increase your rate, you’ll travel safer with well-rested drivers. Most coach hire services will require you to pay for and book your driver’s hotel for overnight trips. Be sure to provide your driver with a room at a clean and safe hotel to ensure they are well-rested throughout your trip. Ask your hotel if they provide discounted or free rooms for drivers when you book a group reservation. Although gratuity is typically not included in quotes, tips are greatly appreciated. Thank your driver for their time and dedication with a tip of 10-20% of your total coach hire price. You can either bring cash in a separate envelope, or speak with your representative about other tipping options. You get the most value out of your coach hire when you fill up as many seats as possible. The more passengers you have filling seats on your bus, the less it costs per person. For example, a group of 56 passengers total on a standard-sized coach hire will often pay less per person than a 20-passenger group. If your group has 35 passengers or less, a minibus may be the best option for you. Minibuses usually cost around £100-200 less than a standard coach hire. However, with no on-board toilets and fewer storage compartments, minibuses are better for shorter trips. If you’re unsure which bus is right for your group, learn more about the differences and speak with your representative. Always review your service provider’s deposit requirements, payment schedule, and cancellation policy before booking your trip. Keep in mind that you will be expected to pay a flat rate deposit or percentage of your entire bill upfront. Most companies require you to submit your final payment 30 days before your trip. Most coach hire companies allow you to cancel your reservation several months before your trip for a full refund. However, if you cancel within 30 days of your transport date, you may only receive a partial refund or none at all. Now that you’ve learned the different factors that affect your coach hire’s cost, you’re ready to prepare your itinerary and call for quotes. Ensure your itinerary is detailed and includes every stop along the way so you won’t have to pay for additional mileage or hours. Book your trip as early as possible and avoid May, June, and July. Avoid deadhead costs by booking a bus in the same location as your first pickup and last drop off location. 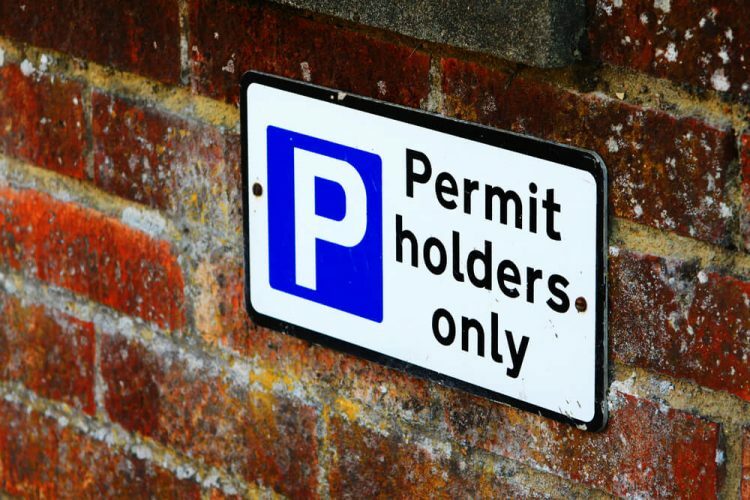 Call your hotel and venue before your trip to learn about bus parking permits. Ask your hotel about discounted or free rooms for your bus driver while booking a group reservation. Be sure you’re booking the right bus for your group to get the most value out of your coach hire. Every trip and coach hire is unique. Planning a trip can be overwhelming, so ensure you are receiving the best quotes by speaking to a knowledgeable coach reservation specialist. As long as you tell them your itinerary, they’ll be able to provide you with a quick and easy quote. If you’re unsure how coach hires work, learn more about the process or ask your reservation specialist. At GOGO Charters, we’re experts at organising transport for groups of any size for a wide variety of trips. With over 5 million miles logged in cities across the U.S, Canada, Europe, and Australia, there’s a reason we have 1 million happy customers and counting. We’ve worked with everyone and are here to help you plan your next trip in the UK for weddings, corporate events, sport outings, church trips, and more. Call us today at 44 20 3617 1779 for a quote! Call GOGO Charters at 44 20 3617 1779! We can help. Call us now 44-20-3617-1779 to reserve yours.